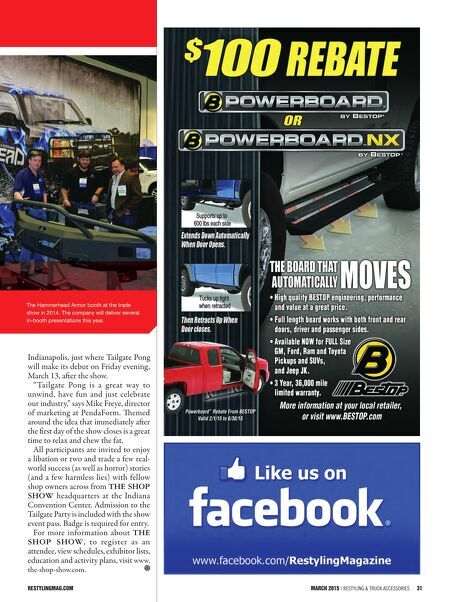 30 Restyling & tRuck AccessoRies | March 2015 restylingmag.com special section of the exhibit hall. e area will be set up so that show attendees can take their time, evaluate and compare products that represent some of the industry's latest technolog y," says Laurie Zydonik, Trade Show Sales Manager, THE SHOP SHOW. "e Shop Showcase" will feature prod- ucts from suppliers to the performance, racing , hot rod, restoration, restyling and truck accessories aermarkets. Beer Meyer USA says it will provide a chance to relax as the show unwinds Friday aernoon and has invited everyone to its booth for a free beer party! Immediately following Meyer's beer party is the Tailgate Party at the JW Marriott, sponsored by PendaForm and car builders. The JW Marriott is in downtown THE SHOP SHOW provides an intimate setting for easy conversation and networking.